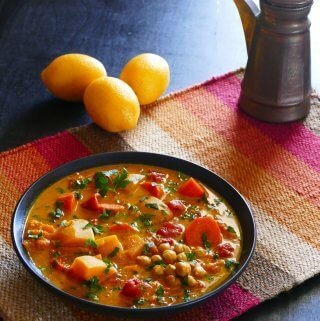 This Vegetarian Instant Pot Moroccan Stew is so delicious that you won’t miss the meat! The stew has a dynamite combination of ingredients that gives it a rich, complex flavor that you’re going to love. Serve with a lemon and herb couscous, or quinoa. 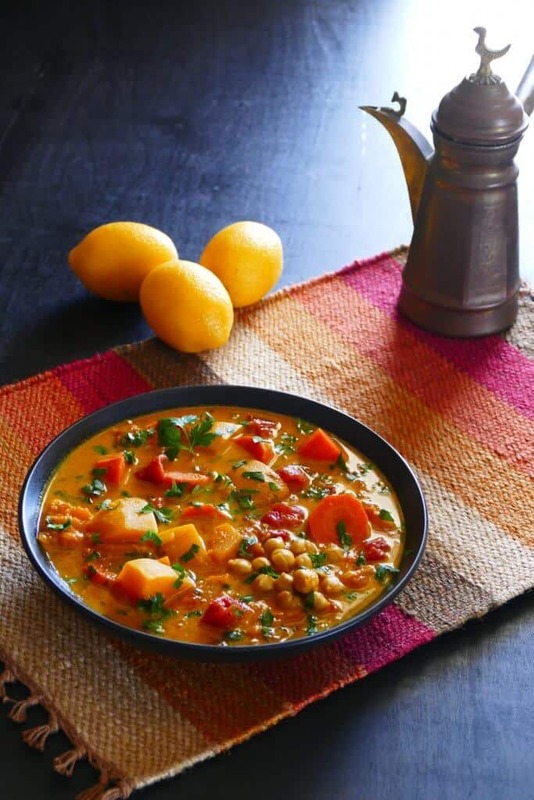 This Instant Pot Moroccan Stew recipe is delicious, flavorful and so beautiful. The colors you see in the photos are real! You’ll find that the mmmmm’s and ahhhhh’s will keep on coming when you serve this to your family or guests. And it’s so healthy that there’s no guilt in going back for seconds. My family likes meat – chicken, beef, pork – and they can be pretty picky about vegetarian recipes. So when I say they love this recipe, that means this truly is an extra-special recipe! 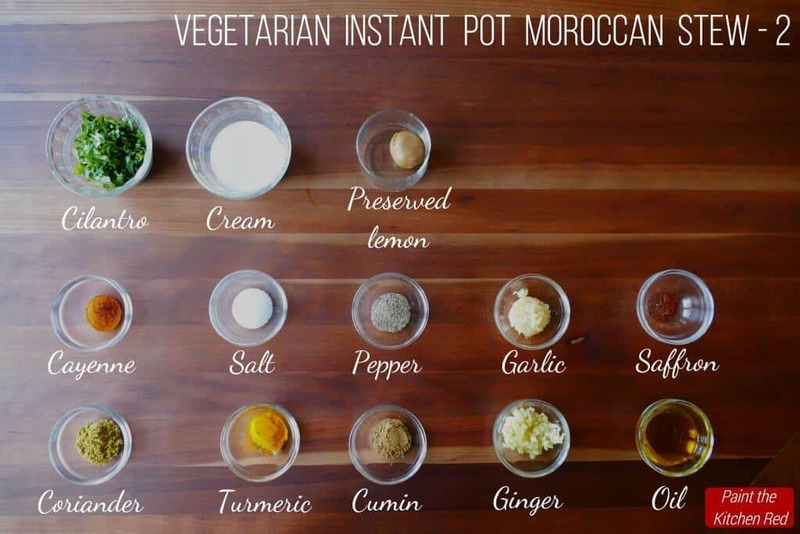 This Vegetarian Instant Pot Moroccan Stew recipe has authentic ingredients, except for cream. I’ve taken the liberty of adding cream because I love the flavor it imparts to this recipe. An authentic Moroccan stew recipe wouldn’t have cream. Cream is my own twist to this recipe because I really like the creaminess and flavor it adds to the recipe. However, this recipe tastes really good even without it. Make it vegan and healthier by omitting the cream. Preserved lemons are one of my favorite ingredients in this recipe. Yes, you can use lemon juice (approximately 2 Tbsp, or to taste) as a substitute, but the preserved lemons add an extra-concentrated jolt of citrus flavor. Make your own using this preserved lemon recipe, or do what I do and buy a jar. They’re available at Middle Eastern or international grocers or purchase preserved lemons on Amazon. Saffron is a delightful ingredient that adds another dimension to this Moroccan stew recipe. Saffron is an expensive ingredient, but a little goes a long way. If you don’t want to buy it, just omit it. If you’ve never tried harissa and you like spicy food, this is the recipe to try it out in. Add the harissa after the Instant Pot Moroccan stew is finished cooking. A little goes a long way, so add a teaspoon at a time, and taste as you go. I find harissa at my local grocery store, in the ethnic foods section. You can change up the recipe by sauteing about 1 cup spicy sausage, sliced thinly into half-moons, before sauteing the onions. Chicken (cut into about 2-inch wide pieces) would also work for this recipe. Pressure cooking time stays the same. You can also use chicken broth in place of vegetable broth. 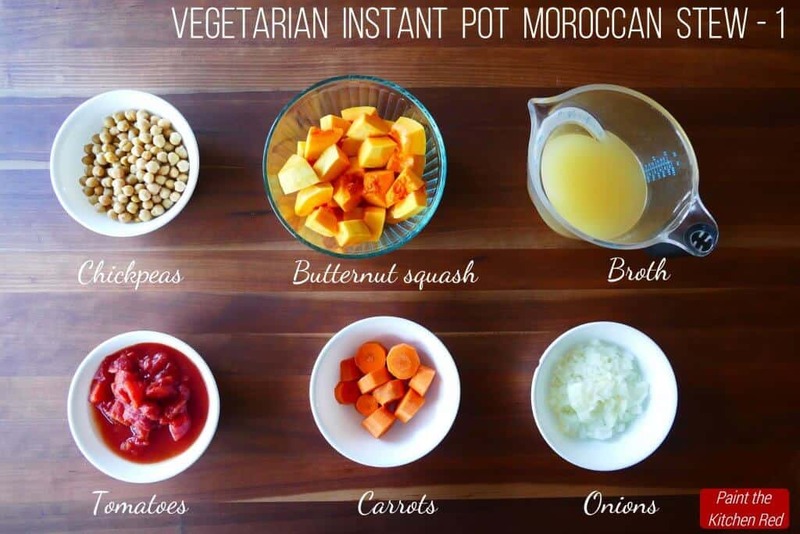 If you’re new to the Instant Pot and aren’t familiar with how to use it, please read the Instant Pot DUO Beginner’s Quick Start Guide or the Instant Pot ULTRA Beginner’s Quick Start Guide first and then come back here to learn how to make this Vegetarian Instant Pot Moroccan Stew. Once the Instant Pot has pre-heated, add oil and allow it to heat up. Stir in onions, and saute till soft, about 1 minute. Stir in garlic and ginger. Add in salt, black pepper, coriander, cumin, turmeric, and cayenne pepper. Deglaze with a couple of tablespoons of broth. Stir to remove any brown bits. There should be nothing stuck to the bottom of the inner pot. Once deglazed, stir in remaining broth. Add butternut squash, carrots, and preserved lemons. Stir to combine. Add tomatoes, but don’t stir. Just push down with a spatula to immerse in the broth. Select Pressure Cook mode and adjust the time to 6 minutes (00:06). Stir in chickpeas, saffron, and cream (optional). Serve with couscous or crunchy bread. This Vegetarian Instant Pot Moroccan Stew is so delicious that you won’t miss the meat! The stew has a dynamite combination of ingredients that gives it a rich, complex flavor profile that you’re going to love. Serve with a lemon and herb couscous, or quinoa. 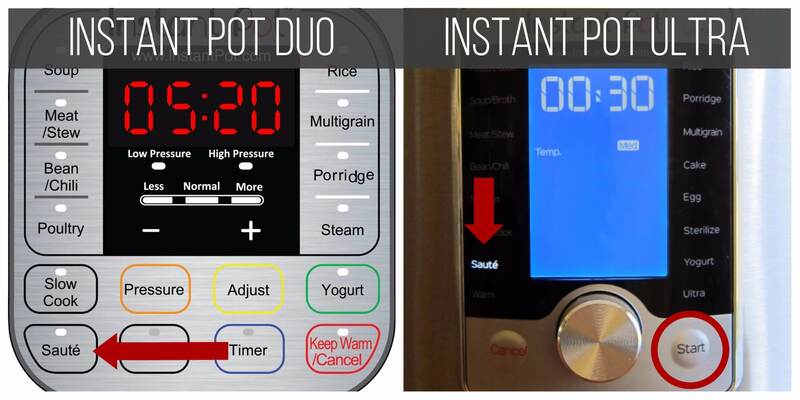 Select the 'Saute' function and pre-heat the Instant Pot. Add oil to the pre-heated inner pot of Instant Pot and allow it to heat up. Add tomatoes, but don’t stir; push down with a spatula to immerse in the broth. Do a Quick Release (QR) of pressure. Press ‘Cancel’ and open the Instant Pot lid. Stir in chickpeas, saffron, and cream (if using); heat through on 'Saute' mode. harissa, to taste, at the end. I fed an international group this evening – only one of six a vegetarian. It was a TOTAL success. Don’t hesitate- make this dish. It is amazing. I’m so glad to hear that – same with mine, which is very unusual, lol! Silly Question. I’ve never cooked with preserved lemons. After the dish is through cooking, do you remove the lemons? Or cut them up or just eat them as is? I made this last night and absolutely loved it. One of the easiest recipes ever and so delicious. Thank you Hitee! I love this recipe so much – especially because it’s so unexpectedly good! This stew looks delicious! I’m definitely making this the next time I head to the store! Thank you so much for sharing. Thank you – hope you love it! Excellent! Easy and so good! I glad to hear you liked it, Joan. 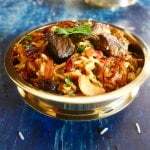 I love this recipe and am hoping more people try it out because I know they’re going to love it! Received an Instant Pot for Christmas and this was the first recipe I made. Amazing flavor! Made it again the following day. Albert, I feel this recipe is a hidden gem, thus far! For whatever reason it’s not been tried by a lot of people – I hope your comment helps that situation 🙂 I love this recipe so much – you made my day! Would coconut milk work in place of the cream? Melisa – I think that would taste great. Probably not traditional (neither is the cream), but it’s the taste that matters, right? Let me know if you try it. I love love this recipe. Delicious and simple! I added sliced chicken thighs for my family, but would have been just as happy with a vegetarian dish. Skipped the cream. Love the bright flavors – thanks for a great recipe! Jen, thank you for your comment and rating! 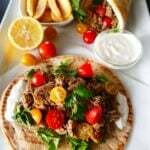 I love this recipe and am so happy that you loved it too! Yup, you definitely don’t have to do the cream – it’s super even without it. Thanks, Saaz! Did you use harissa – it can be pretty spicy 🙂 If you didn’t, the heat must have come from the cayenne. Just reduce it next time. This was awesome. I am not a vegetarian but I loved the dish. Cut down on the cayenne if you don’t want it spicy. Christoper, thank you for the comment and I’m always happy to hear that people appreciate my level of detail! 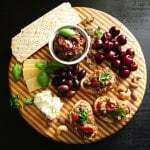 This recipe was recommended by my friend Albert, who posted a comment above. I have made it multiple times now – it’s our favorite Instantpot recipe!